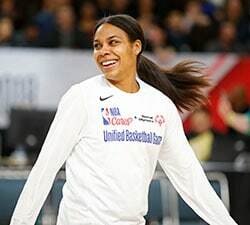 NEW YORK – One of the best reactions at Thursday night’s WNBA Draft happened when the Washington Mystics selected Maryland guard Shatori Walker-Kimbrough with the No. 6 overall pick. The family members at her table erupted in cheers, especially Walker-Kimbrough’s mother, who tried to fight back tears as she hugged her sharpshooting daughter. Walker-Kimbrough’s mom is known for getting so nervous during Maryland games that she can’t bear to watch. She would often station herself on the concourse rather than remaining in her seat, and if she was at home, her eyes would often be fixated on something other than the television. Thursday night, Walker-Kimbrough and her mom were front and center as ESPN’s cameras captured the special moment. Other than just getting drafted, one main reason for her family’s jubilant reaction Thursday night was that Walker-Kimbrough doesn’t need to travel far to start her professional career. Less than 10 miles, in fact. 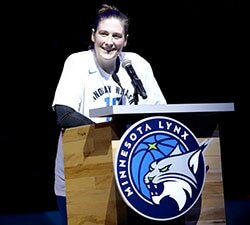 Walker-Kimbrough is originally from Western Pennsylvania, and she’ll remain close enough to home that her family can continue attending games. Perhaps the top outside shooter in this draft – she led the nation by draining nearly 55 percent of her three-point attempts as a senior – Walker-Kimbrough joins a Mystics squad that already boasted some of the best in that department. Emma Meesseman and the newly-acquired Elena Delle Donne had two of the three best three-point shooting marks among frontcourt players last season. And free-agent signing Kristi Toliver, another Maryland alum, is coming off an outstanding season of 42.4 percent from deep. Walker-Kimbrough couldn’t have asked for a better draft night. 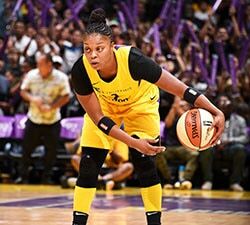 She gets to stay home and play for a team that most feel is a title contender, one that features veteran stars she can learn from during the early stages of her career.